Mtn just recently introduced a new bundle plan which is called the MTN Bundle4U. With this new bundle, you get airtime to call both national and international numbers(selected countries only), free SMS and also data to surf the internet. The MTN Bundle4U is divided into two(2). The xtravoice which gives you more of airtime compared to data and the Xtradata which gives you more of data compared to voice calls. So if you do more of browsing then you might prefer the Xtradata and if you call more then you can choose the xtravoice. 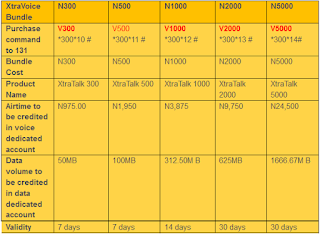 MTN XtraVoice BUNDLE4U: As I said earlier, this gives you more airtime to make both local and international calls to some selected countries but gives you lesser data to browse and it's divided into 5 different plans. To subscribe, all what you have to do is to SMS the matching keyword according to the price to 131. Example: SMS V1000 to 131 to subscribe for the N1,000 naira xtravoice plan. 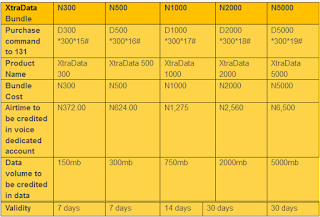 MTN XtraData BUNDLE: This gives you more data to browse and gives you lesser airtime to make both local and international calls to some selected countries and it's also divided into 5 different plans. Example: SMS D1000 to 131 to subscribe for the N1,000 naira Xtradata plan. Note: This bundles works for all prepaid and post-paid customers except those on MTN beta talk tariff plan. So if you are in beta talk, you have to migrate to other plans to enjoy this offers. This plan will auto renew once it expires as far as you have enough airtime on your phone. Hello, I understand how u feel getting your phone bricked, however, it's pretty easy to unbrick ur phone without going to the repair shop, u will need a stock Rom of your phone den follow the complete guide below to get ur phone running again..
Hello, could you please help me on how to unlock my MTN Huawei E5830S mifi modem? I have tried to get unlock codes but it doesn't work. I would be glad if you can help. Thank you very much.